In Foldit, players are presented with a model of a protein, which they can fold by using a host of provided tools. The game evaluates how good of a fold the player has made, and gives them a score. Scores are uploaded to a leaderboard, allowing for competition between players from all around the world. 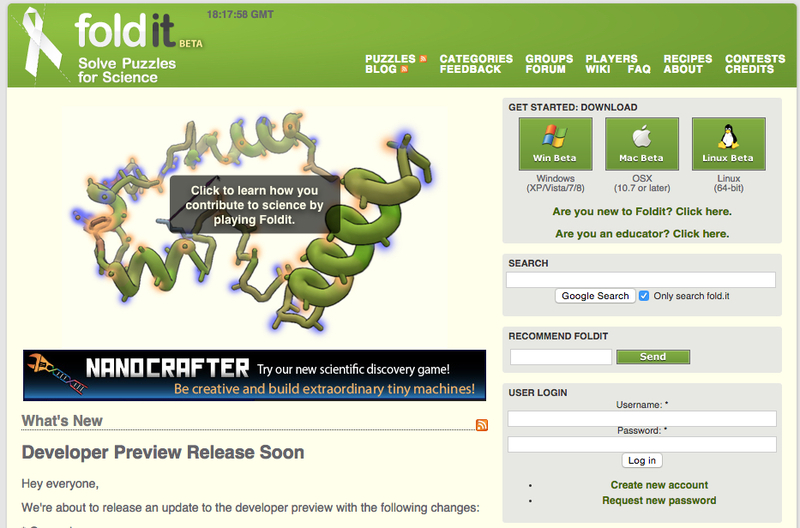 Since its release, Foldit has gained over 100,000 players from all walks of life. In fact, the best Foldit players have little to no prior exposure to biochemistry. These players have helped to push Foldit to the forefront of protein folding capability, showing that for a particularly hard proteins, Foldit produced predictions outperform the best known computational methods. These results were reported in Nature journal, marking the first time the leading scientific journal has published a paper with over 57,000 authors, vast majority of whom have no background in biochemistry. More generally, Foldit showed that it is possible to effectively “crowdsource” human problem solving to solve very hard scientific problems, and that the gaming environment is capable of turning novices into highly skilled researchers. The goal of the Center for Game Science is to generalize and expand the success of Foldit to a wider range of problems in science, education and beyond.